THERESA May has been told that yesterday’s speech was great fun but she now needs to announce the real Brexit plan. 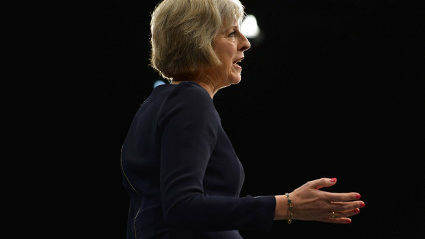 Despite zingers in May’s speech about having no plan being a good thing and holding Europe to ransom by threatening to set fire to her own hair, economists believe Britain now needs a strategy that is not insane. Backbencher Denys Finch Hatton said: “Brilliant, absolutely classic stuff, but seriously how are we going to unfuck this? “I enjoy having a laugh about how we’re going to intimidate over half a billion people by selling some jam, but at some point I’ll have to tell my constituents what we’re actually doing. Researchers have scanned any previous utterances by the prime minister for the faintest trace of humour without success, with one possible bon mot being revealed as a sneeze. Labour hit back at yesterday’s speech by saying they would have told broadly the same 43-minute joke but their punchline would have mentioned worker’s rights. A COUPLE who have enough money to make their house bigger should stop whining about the trauma it is causing them, it has been confirmed. Tom Booker and his partner Emma Bradshaw keep harping on about how stressful it is to have builders in their house despite the fact that they paid them to be there. Bradshaw said: “The builders did explain before they began that it would be a messy and inconvenient process, but we didn’t bother to listen because we were discussing whether Farrow and Ball’s ‘Elephant’s Breath’ would work in the new kitchen nook. “Then they turned up with hammers and dust and noisy tools and caused absolute carnage. They’ve been here for literally days, acting as if structurally altering a house is a big deal. “Despite the fact that we are intelligent people who understand what ‘building’ is, we are feeling the need to explain our surprise and disgust to everyone, but most especially our friends who can’t afford to buy houses in the first place.